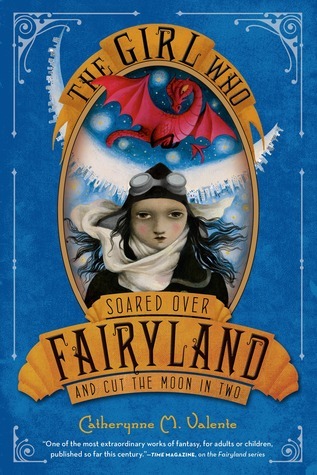 The last, and personally my favorite, installment of the Fairyland series was The Girl Who Soared Over Fairyland and Cut the Moon in Two. Being the third book in a trilogy is a lot of pressure. The story has to be long enough to be satisfying, yet not too long, as no one likes a book that just drags on. This one was the perfect balance. Like the two before it, there was a mythological feeling. Valente created an amazing, world and never once did I question the fantasy logic. If any other author started a book with multiple pages on lying, I would probably be annoyed. But the narrator had such knowledge of humans and life that it wasn’t bothersome, but beautiful. Valente perfectly wrote morals into a genre that doesn’t usually include many life lessons. The younger readers might not fully grasp them, but I appreciate how meaningful the author managed to make all three books. One of the main underlying themes is caring about every single person, place, and object’s opinion. In September’s story dogs can be offended and jackets can be arrogant. Of course, this doesn’t mean inanimate objects can feel and think, but it makes the characters stop and consider, which we should do more in real life. I felt sympathetic for a car. On the opposite side, when the humans happened to be treated like things, it made me stop and think from two very different perspectives: the user and the used. Catherynne Valente’s knowledge of words makes some sentences almost poetic. You’d expect someone to describe clouds as “fluffy” or “white” but “braided” is an adjective I’d never think to use for nature. As a writer and lover of poetry and words in general, Valente’s descriptions make me smile and stop to think. This is definitely one of the more inspiring books that is fictional. In the book previous September had been searching for her calling since entering Fairyland-below. She knew she was getting older, and everyone seemed to know who they wanted to be and what they wanted to do in life by around her age. A year later at age 14 the question continued to seemingly haunt her: What is my work? This question followed her around, consuming her, for years. I’ve certainly chased the answer to that question for me. September’s searching pays off in a bout of self-discovery. She is meant to…Well I shouldn’t spoil it for you. But in the end, we can choose to do whatever we want to, and make as much of an impact as we desire to. There is something for all of us here, and likewise there is something for everyone in Valente’s works. I am so glad I was able to take part in the wonderful lessons found between the lines. I usually can’t stand writing in books, but I highlighted paragraphs upon paragraphs in this one just because I couldn’t stand the thought of forgetting anything I’d learned from it. This book has definitely earned five stars from me.